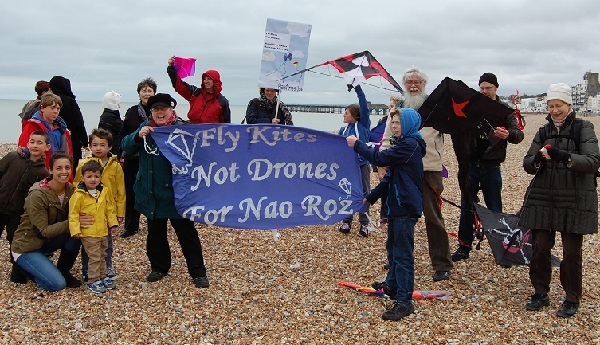 Hastings Against War continues to campaign against the growing use of drones in warfare with a consciousness-raising evening and the annual Fly Kites Not Drones event on the beach. John Enefer reports. In this country, we currently – and one can only hope and pray, permanently – enjoy skies that are free of drone warfare. Residents of other countries are not so lucky. Why we think we can use this technology against others and imagine it will never happen to us, is beyond comprehension. Acknowledging this, Hastings Against War has organised Fly Kites Not Drones 2018, in peaceful solidarity with people who live in countries where drones have been and are still causing death, injury and fear. Rona Drennen writes. We are flying kites on this day in solidarity with young people who live in countries where drones are causing death, injury and fear: countries like Syria, Iraq, Pakistan, Afghanistan, Palestine, Yemen and Somalia. Children should be free of war, free to play, to walk to school without fear of being bombed. Rona from Hastings Against War writes.